CHIditarod XII was a great success thanks to everyone involved. The CHIditarod Foundation raised more than 25,000 pounds of food for those in need, in a heroic effort to fight hunger. Thanks to generous donors and competitive teams, we were able to meet new fundraising goals to help like-minded organizations trying to better Chicago. This year we are able to again give out $25,000 in funds Chicago-area 501(c)(3) organizations that are directly fighting hunger, making an impact on local food sustainability, and/or empowering individuals and communities through food education. We were truly blown away by the inventive ways organizations are making a change in the communities around them. There were so many great applications it was hard to choose who to join on their fight against hunger. The CHIditarod Foundation chose eight organizations doing amazing work. We are thrilled to introduce the 2017 winning organizations! Advocates for Urban Agriculture – The AUA, whose membership totals more than 2,000 growers throughout Chicago, engages with individual and community growers in some of the city’s most high-risk neighborhoods. Their Crop Mobs program, with the support of the CHIditarod Foundation, expects to reach a minimum of 500 low-income existing and potential growers during the coming year. Angelic Organics Learning Center – Angelic Organics Learning Center builds sustainable local food and farm systems through experiential education and training programs in partnership with rural and urban people. They will be using their grant money for the ‘The Eat to Live Project,” addressing critical food system issues in the neighborhood around growing sites. The Incubator Farm in this project will address the scarcity of locations for new urban farmers to launch businesses on Chicago’s south side, low-income areas. 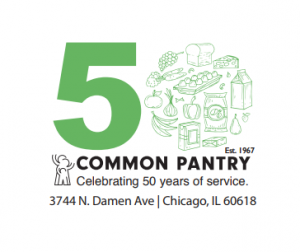 Common Pantry – Common Pantry was established in 1967 and is Chicago’s oldest continuously run food pantry providing emergency food on Chicago’s North Side while addressing the root causes of food insecurity and poverty. Their grant funds will help support the expansion of their food distribution program for the 2018. As of July 1, 2017 Common Pantry added a distribution day each week and expanded their territory to serve more needy households, as two food pantries in the area recently closed. Peterson Garden Project – Peterson Garden Project’s mission is to teach everyone how to grow and cook their own food. During the Spring and Summer of 2018, their Feast of Resistance program will provide the opportunity to learn about and support refugee issues on a local level working with Camp GirlForward campers to share stories from their countries as they are taught to grow food and cook together. Plant Chicago – Plant Chicago seeks to change the way cities develop the critical infrastructure—waste, water, energy, and food access—that will support an increasingly urbanized population. Funding from the CHIditarod Foundation will help expand cooking and nutrition education offerings, give incentives to low-income families to make shopping at their farmer’s market more affordable, and integrate community needs and culturally appropriate offerings into our current farmers market and cooking education programming. Purple Asparagus – Purple Asparagus’ mission is to educate children, families and the community about eating that’s good for the body and the planet. Funding from CHIditarod, will increase Purple Asparagus’ reach and further its mission, expanding programming into the summer camp setting. They aim to ​develop​ ​and​ ​run,​ ​on​ ​a​ ​pilot​ ​basis,​ ​a​ ​summer​ ​camp​ ​program,​ D​elicious Nutritious​ ​Summer​ ​Adventures​. South Merrill Community Gardens – The South Merrill Community Garden memorializes Troy Law, a former student of O’Keefe Elementary School, who died as a result of domestic violence. 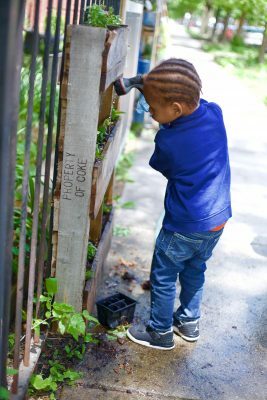 The garden serves as a counterweight and positive influence in a neighborhood that has been impacted by gun, gang and drug-related violence. They will using funding for their Young Growers Program, where students from O’Keefe will become seed to table gardeners. They will learn seed starting and gardening, planting garden management and maintenance, and participate in a harvest to table cooking class. Urban Muslim Minority Alliance (UMMA) Center – The UMMA project aims bring more fresh produce, nutritional education, and expanded access to locally sourced food to a community surrounded by food deserts. Funding will be used to increase the quality of our food pantry supplies, aiming to include fresh vegetables, meat, and dairy, instead of the usual non-perishables and canned goods. UMMA will also provide more classes on healthy cooking and eating, with local community garden programs training students in how to identify healthy food while shopping, grow produce, and cook healthily. This year we also hosted an Open Grant Night, where organizations could come out, spread their message and programs and receive votes for an additional grant. CHIditarod’s grants to Chicago community-based organizations fighting hunger would not be possible without our generous donors, volunteers, and partners. We are grateful for their continued support. The CHIditarod Foundation is a 501(c)(3) nonprofit organization dedicated to solving the root causes of hunger through creative events and direct action. Our flagship event — The CHIditarod — brings together 1,000 people annually and has funded $120,000 in small grants for local anti-hunger initiatives since its inception. The CHIditarod takes place annually on the first Saturday in March. On March 4, 2017, CHIditarod marked twelve years of philanthropy, with 565 costumed racers chasing their dreams of CHIditarod glory and making a difference in the fight against hunger. Since its humble beginnings in 2006, CHIditarod has raised more than 172,000 pounds of food and $228,000 in the fight to end hunger in the greater Chicago area. For more information about CHIditarod and the CHIditarod Foundation, follow us onFacebook, Google+, and Twitter.